It’s not as chilly in the Northeast today, but it still cools off by evening, especially since it’s getting darker earlier and earlier. And that means it’s great weather for cooking all the fall dishes you’ve missed! 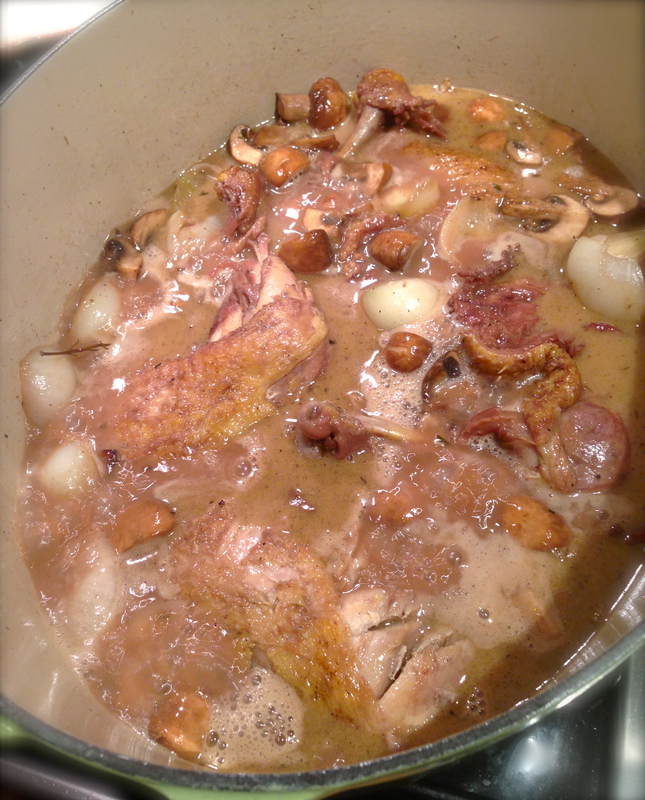 Since I got a new Le Creuset round braiser as a wedding gift, coq au vin seemed like the perfect way to break it in. I decided to re-post this recipe before having the final product. Sadly, I’ve been told to take it easy for the last few weeks so have to keep off my feet more than usual. But that doesn’t mean I need to stop cooking entirely- instead, I’m getting a little assistance and letting the Daddy-to-Be cook more than usual (fortunately, he’s a great chef!). Happy Fall and Happy Cooking! 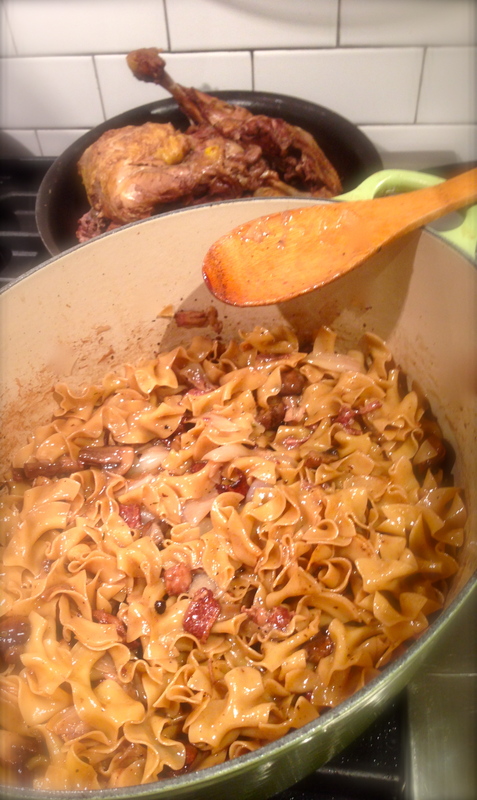 Almost every recipe for Coq Au Vin uses bacon or pancetta, but some cook the bacon separately. 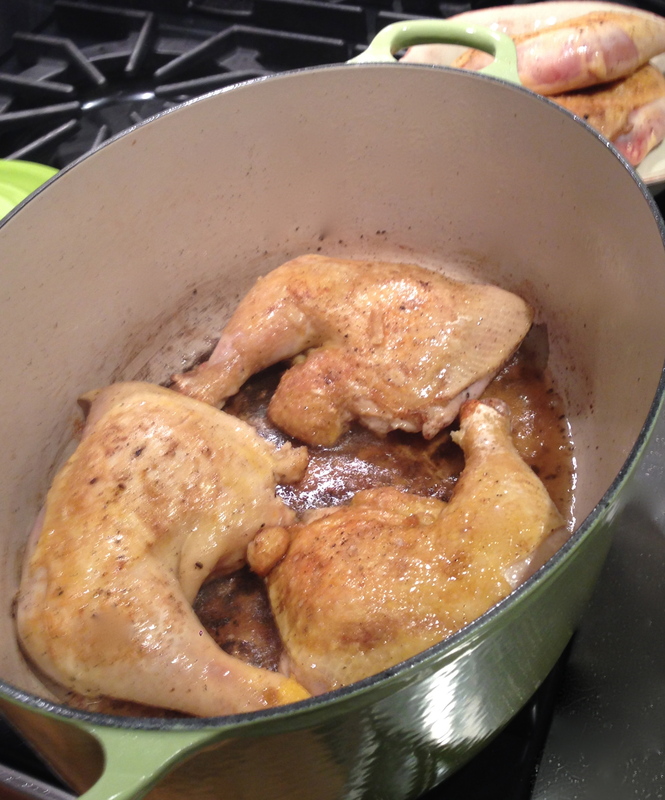 (Why anyone wouldn’t want to brown the chicken in that flavorful fat I have no idea!) And now it’s up to you whether you want to use red or white wine. Riesling has been quite popular recently. Most versions also call for the time-consuming process of browning onions and adding them to the chicken along with button mushrooms. My version simplifies these steps without sacrificing the flavor. You can also decide whether to add tomato paste or carrots, which are found in more recent takes on the dish. It’s up to you whether you want a hint of sweetness to cut the rich flavors. I prefer to let the wine and butter come through and didn’t need anything to thicken the sauce. Plus, fewer ingredients = less work. 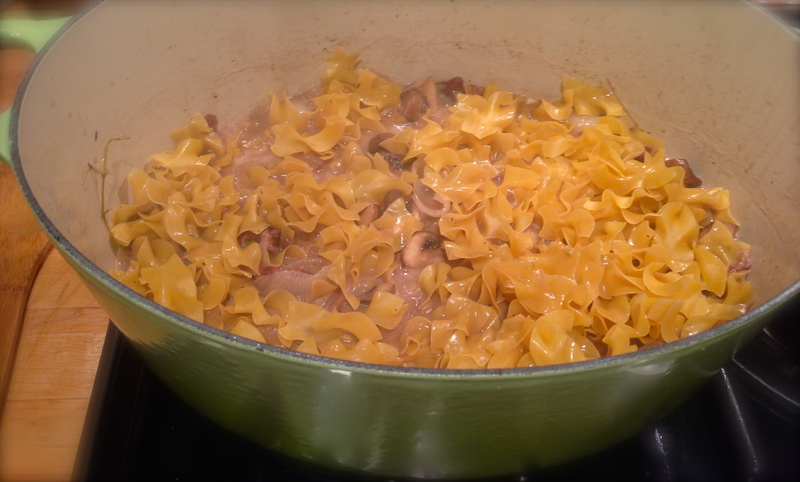 In fact, I even added egg noodles to the braising pan for a completely satisfying almost one-pot meal. And it tastes even better the next day, if you manage to have any leftovers. 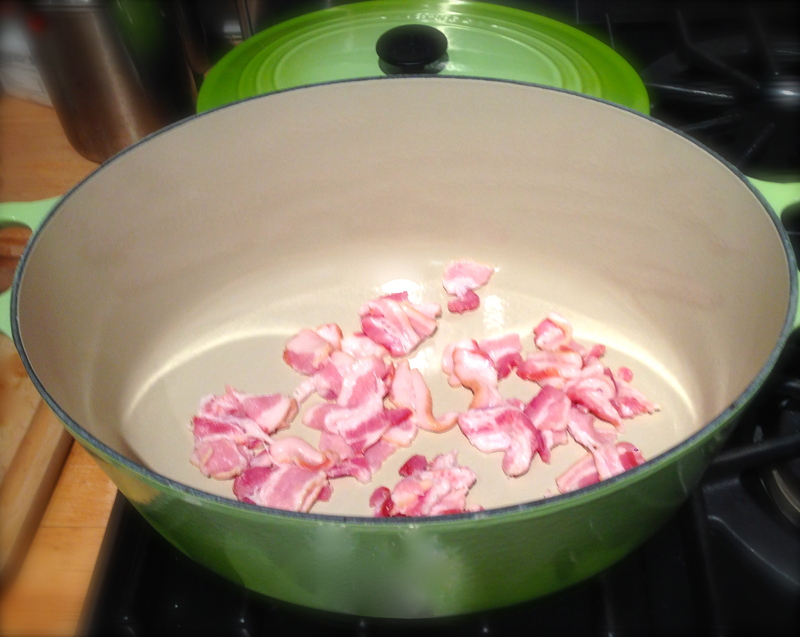 Brown the bacon for about 8 minutes over medium high in a deep pot large enough to hold the chicken. Turn the heat to medium high. Sprinkle the chicken with salt and pepper and then brown for about 12 minutes, flipping once. (You may need to do this in 2 batches). 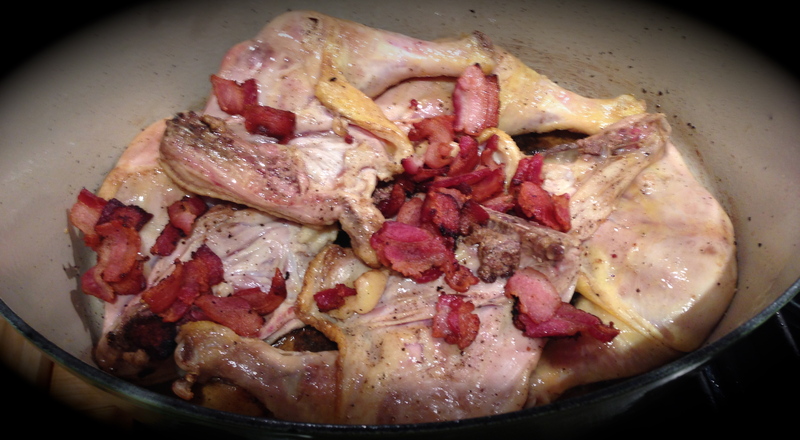 After browning, turn burner to low and with all chicken in the pot and add the bacon. Then add the brandy. Cook for 3 minutes. Then add the wine. Cook for 5 minutes over medium low. Then add the stock, bay leaf and a few sprigs of thyme. Sprinkle with salt and pepper. Bring to a boil. Then cover and cook over low for 50 minutes. In the meantime, make the onions and mushrooms. I decided to peel the onions first and then boil them in salted water for 3 minutes. Some recipes let you boil and then peel- whatever is easiest for you. 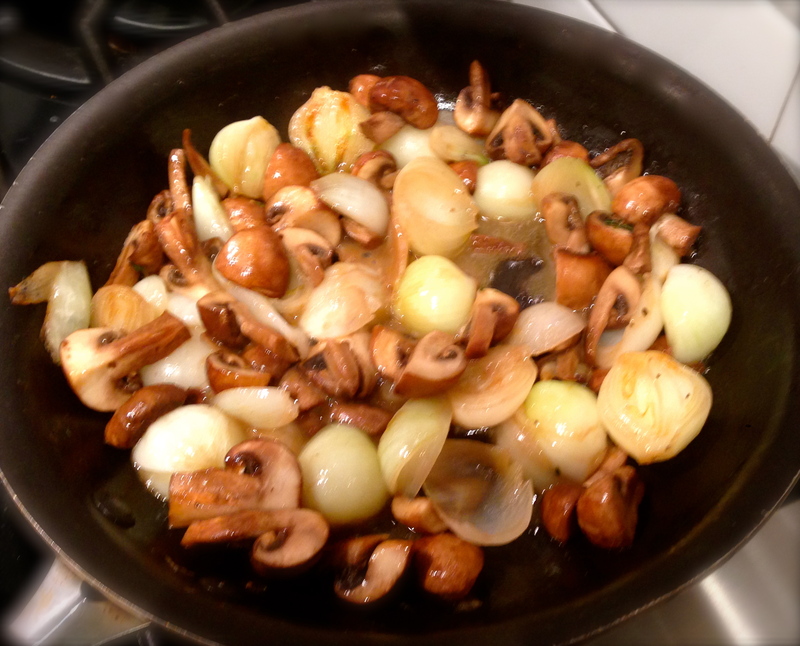 Let the onions cool, while you cut the mushrooms into quarters unless they are very small. In a small saute pan, melt the butter over low heat, then add the mushrooms. 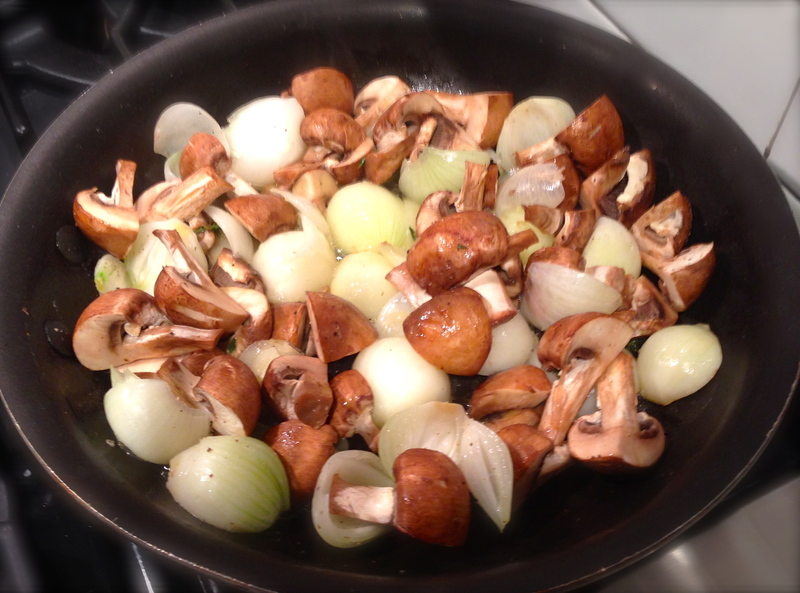 Cut the onions into halves and add those to the mushrooms. Sprinkle with salt, pepper and thyme. Cook for 10 minutes over low. Do not let the mushrooms cook down too much. 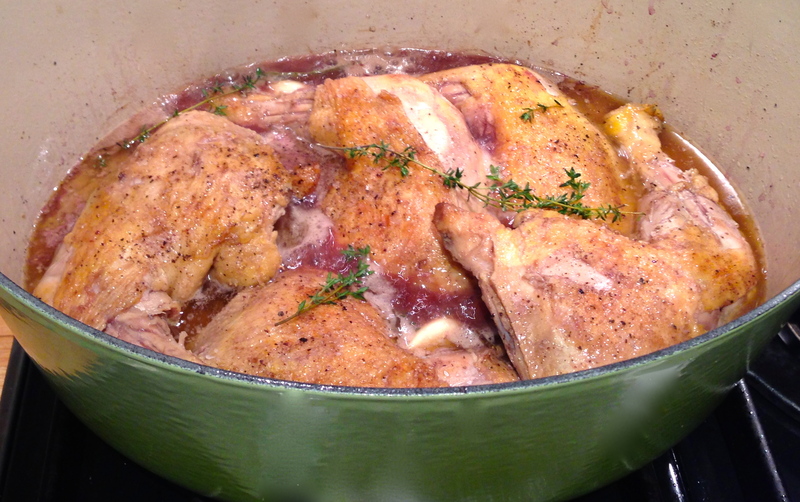 Add to the pot with the chicken whenever ready. 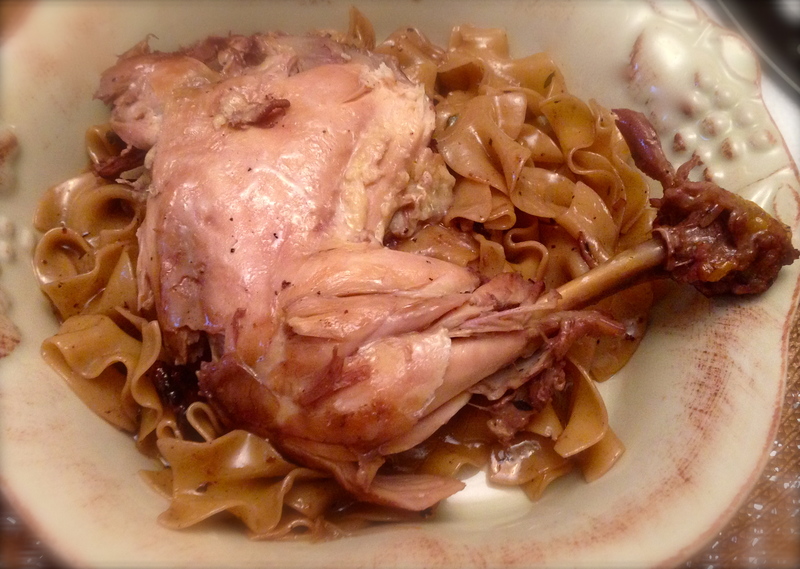 If making egg noodles, you can boil them separately and place the chicken and sauce on top or … remove the chicken from the pan and set aside. Add the noodles to the sauce. Cook over medium from 10 minutes or until noodles are cooked. Then plate with chicken on top. To drink: whatever wine you used to cook with is the obvious and best choice. Or you can opt for one of the new aged craft beers that act more like wine. If you want a cocktail, I would suggest a classic gin martini with olives, which goes with almost anything. I’m looking forward to having one in a couple of months! Looks great! 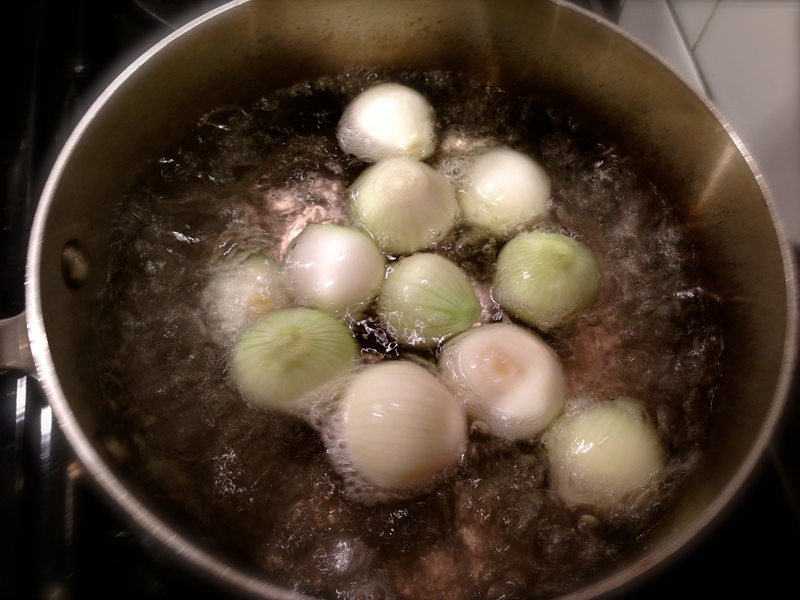 Braising the onions separately is worth the extra work, because they will become so much more flavorful. I add them at the very end so they keep their flavor. Thanks! I still send everyone your way when it comes to sous vide. Recent article in The NY Times suggesting 24 hrs at 131 for a beef chuck roast. Seems off to me. I agree. I’d go at least 48 hrs at 135. Or even 144!